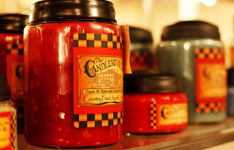 Honeysuckle, Vanilla Crumb Cake, Warm Caramel Brulee, and Hot Maple Toddy – The Candleberry Co. 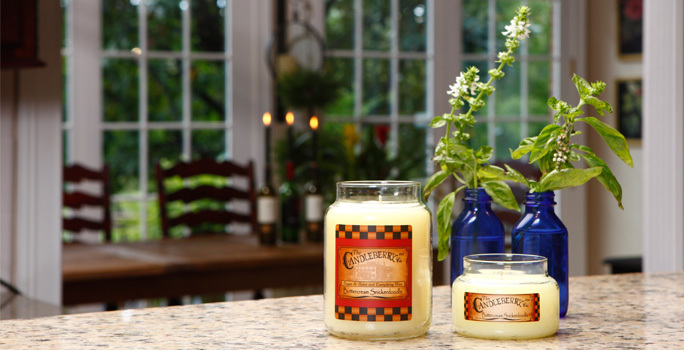 I find myself browsing The Candleberry Company’s website many, many times throughout the year. I can always find the old reliables there (Hot Maple Toddy and Kentucky Bourbon to name a few), but they always seem to have something fresh and exciting there, too. The website greets you with such beautiful photography, it’s hard to resist anything! Truthfully, I’m not sure why I don’t shop here more often. 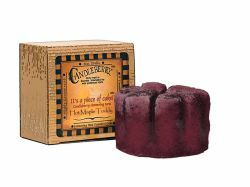 I’ve purchased a few things from Candleberry in the past and I have always been well pleased. When it came time to do a formal review for them, I jumped at the chance. I knew I would be in for some quality products and fantastic scents. Yes! I was sent a variety of products to test. Included in this review was their large (26oz) candle jar in Honeysuckle; two small 10oz candle jars (one in Vanilla Crumb Cake and another in Warm Caramel Brulee and their wax melts in Hot Maple Toddy. What did my Candleberry Co. products look like? This was an apothecary jar style with a clear glass body and a black, domed lid. The lid was embossed with the Candleberry Company logo. There was a label on one “side” of the jar with the trademark checkerboard pattern at the top and bottom. In the center of the label was the company logo and scent name, along with the saying, “Sugar & Spice and Everything Nice.” There was the faint picture of a building (a house?) in the background. The label was not easily removable, but certainly could be if you wanted a clean jar. The wax itself was a beautiful, pale yellow with a single wick. This single-wick candle was a shorter, rounder version of the large jar. The label was very similar minus the building in the background and the “sugar/spice” saying. The wax was a creamy tan color. This was similar to Vanilla Crumb Cake with the exception that it was a darker brown wax. Loved this wax melt! It was a round cake-like wax melt sliced already into 8 sections. The sections were held together at the base, so that it was easy to snap off a piece or two as needed. The entire “cake” came packaged in a brown gift box with a decorative label on the lid. The Candleberry logo was present again, along with the scent name and the phrase, “It’s a piece of cake!” There was also a note indicating this was not edible. Cute! This wax was a deep burgundy color. What did my Candleberry Company products smell like? I grew up in the South and I am very familiar with the honeysuckle vines. 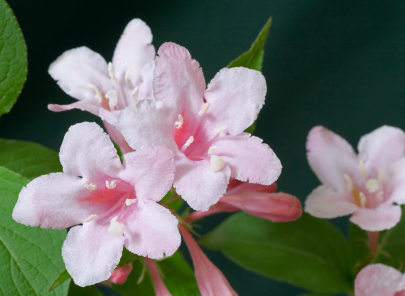 I remember being overtaken by the fragrant aroma from these delicate flowers and what fun it was to taste the nectar. Ah… sweet youth! Being the self-proclaimed honeysuckle “expert” that I am, I am pretty tough on the honeysuckle scent in wax. To me, true and authentic is hard to come by with this scent. Did Candleberry capture the essence? On cold sniff, it certainly seemed so! The scent was light but definitely true. Not perfumey or artificial. I couldn’t wait to burn this one! Since it was such a large jar (and a floral at that), I decided to forgo my usual small test space and put this big boy out in the open. It didn’t take long before the beautiful aroma of sweet honeysuckle filled my large, open living area. Oooooh my! It was so incredibly real, I kept closing my eyes and imagining those summers in the backyard. This scent was spot on! The scent throw was moderately strong but not too overpowering that I thought I would have to blow it out. Still, it had to pack a punch for this single candle to fragrance my living area. This scent was a definite winner to me and something I would reorder. It looks like this may be a seasonal offering, as I don’t see it on the website right now. Oh… my! Once I took the lid of this candle, I was in Smell-O-Heaven. The vanilla cake scent was so rich and warm, it was incredible. And that was without being lit! I did light this candle in my powder room, which is my usual starting point for candles and melts. I left this candle for approximately 30 minutes and went to do some work elsewhere in my house. I started noticing this scrumptious cake smell and I couldn’t believe it…didn’t want to believe it…could this little candle be putting out that much scent behind closed doors??? So in I went and lo and behold… this baby was pumping out the scent. It was AWESOME!!! It was such a heavy cake scent with layers of vanilla and creamy caramel. Ooooh soooo gooood! There were no frosting or sweet, sweet notes to this. It was all cake and all good. Loved! This throw was fairly strong, especially for this size of a candle. Yum-mo! This was a deep rich scent that was full of caramelly goodness on cold sniff. I couldn’t detect the sea salt part on cold sniff. I lit this candle and left it to work its magic in the powder room. This candle managed to scent up that area as well, but it took it a little longer than Vanilla Crumb Cake. I came back into the powder room about an hour later only to be wrapped around in this warm, caramel-y smell. I still couldn’t detect the salt, but it really didn’t matter to me. This was so good, I didn’t need to smell anything more. This was not a sticky sweet smell. It was rich and deep, warm and wonderful. I could see this as a perfect cozy, comfort scent. The scent throw on this one was moderately strong. What a build-up! This was the scent for my Simmering Wax Cake melts. The cold sniff didn’t reveal much, actually. I tried rubbing the pieces and then sniffing, but I still didn’t get much cold throw. I broke off a couple of pieces and placed them in my wax melter (24W electric). It didn’t take long for scent to start throwing off of these. The maple in this was amazingly strong but not so strong that it ran me out of the house. It was toned down a bit with what seemed like some spices (although I don’t see that in the scent description) and the honey. It was such a beautiful combo, that I didn’t want to change this one out for hours! It was a super strong throw just from a couple of “slices” of this wax melt. Perfect! How did my Candleberry products perform? The candles were very slow burning candles. I would have preferred two wicks for my large jar, but the single wick did a fine job. Because they were so slow burning, it did take a long time for them to form a full wax melt pool. I was afraid they weren’t going to make it, but after I let them burn for a few hours, each candle did create a full wax melt pool. The wicks were pretty high maintenance for my tastes. I had a hard time figuring out exactly the perfect cut for the wicks. I cut them too short a few times (drowned) and if I left them a little longer, I would have a dancing flame I didn’t like. It took me a while, but I finally figured out the sweet spot for these wicks. The wax melts were easy to break apart into separate pieces and they melted in my electric melter without a problem. I was more than pleased with my products from Candleberry. 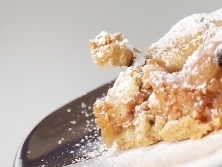 It’s hard to even pick a favorite, but if I had to choose, I would go with Vanilla Crumb Cake. Honeysuckle would be a close second. 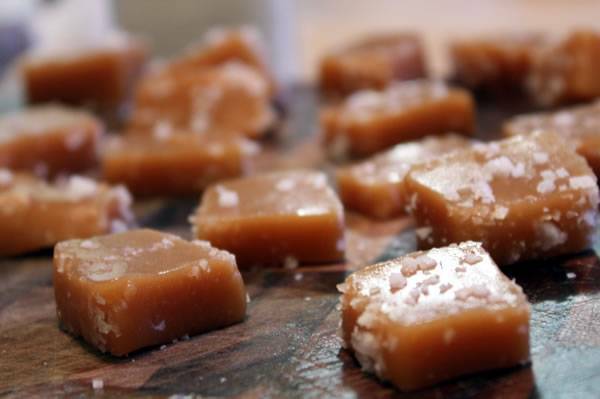 But don’t sleep on Hot Maple Toddy or Warm Caramel Brulee… those were fabulous scents, too! My only complaint would be about the wicks. If you purchase any of these candles, you’ll have to play around until you figure out the right cut for the best performance. I would suggest going a little longer and trimming down from there… slowly! The drowning wick game is just not fun. Overall, though, a huge thumb’s up for these candles and wax melts. I’d suggest you go out and buy you some…today! Have you tried candles from Candleberry? Review them with us…. simply post your comments and star rate your experience in the comment section below.